You may wonder what was going through my mind as I balanced on two apple boxes with a photographer holding a camera between my parted legs taking photos of a giggling Hillary Clinton. I lived in Washington, DC for ten wonderful years. During that time, I was fortunate to perform magic at some wonderful venues and for some very important people. One morning, I received a telephone call from a woman who said she worked for Hillary Clinton (at that time no longer First Lady, but now representing the state of New York in the US Senate.) At first, I thought the call was a wind-up. There were several suspicious factors. The lady was very vague about the details of the event. She mentioned something about a photographer and a book release, but couldn’t tell me exactly where the venue was or when she wanted me to be there. I quoted my hourly fee and after hanging up decided that this was definitely a hoax. However, Turley is the most honest person I have ever met in my life. I think he is incapable of telling a fib. It turned out the prior call from Clinton’s office had been entirely genuine. Turley had given the lady my name since he wasn’t interested in doing the gig. Later that day, the woman called back and I booked this very unusual engagement. 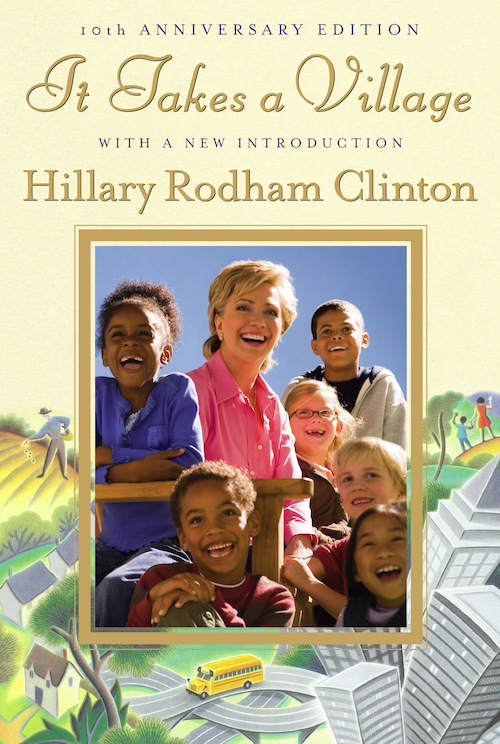 Hillary Clinton’s book “It Takes a Village” was being republished as an anniversary edition and the publisher wanted a new cover photo. The concept was to have Senator Clinton surrounded by happy, smiling children. They had previously attempted to take some photos with some of her staff’s children, but had been unhappy with the results. The photographer decided to hire some child models and have a magician entertain them and make them laugh as he took the photos. And that magician would be me. And so, I found myself performing magic tricks while perched precariously on two apple boxes in a small photography studio in an industrial area in Maryland. Hillary Clinton and six children sat less than ten feet in front of me laughing and clapping at my silly antics, while a photographer holding his camera between my legs snapped away. 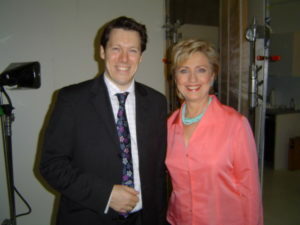 After the shoot was over and I had climbed down from my apple boxes, Hillary came over and chatted for a while. She asked me how my wallet had caught on fire and I of course refused to say. I got a quick photo with her and then she left along with her two assistants and several secret service officers. The photographer seemed pleased with the results as he showed me a few of the shots on his laptop. One of them did indeed end up being used for the cover of the book. So when you look at the picture of Hillary Clinton laughing with those kids, now you know who they were laughing at – me!